Loudspeaker maestro Bang & Olufsen has today released the BeoHome Design App, an iPad app that allows you to place their products within your home to see how they would look if you bought one. It's like a visually-orientated try before you buy. The app allows you to choose from any of Bang & Olufsen's products - so speaker systems and televisions - and then digitally visualise them in any given space that your iPad's camera is pointing at. So, if you've got a cabinet in your living room and want to see how the BeoSound 35 would look perched on top of it, then you simply point the iPad at the cabinet, select the 35 from within the app, and then place it with your finger. In addition to basic placement, the BeoHome Design App also lets you change colours of the speaker fronts, shift brackets and stands on televisions and even build virtual rooms to see how and where products would look best. 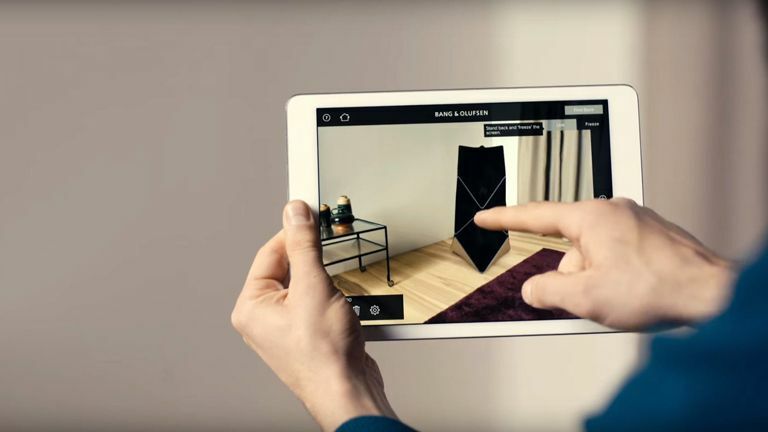 The app also allows you to walk around the your virtual product-filled room to see how the Bang & Olufsen products would look from various angles.